1 of 3 Cook linguine following package directions. Drain and rinse under cold water. 2 of 3 Mix together the soy sauce, lemon juice and cornstarch. In a medium-size saucepan, combine peanut butter, garlic, sugar, red pepper flakes and 1/2 cup hot water. Whisk in the soy sauce mixture and bring to a simmer. Whisk until smooth. Remove from heat; stir in the sesame oil. 3 of 3 In a large bowl, toss together linguine, chicken and peanut butter mixture. 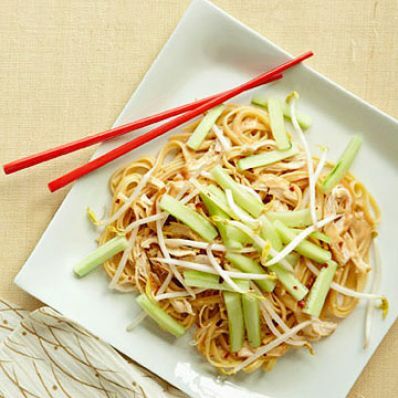 Scatter cucumber and bean sprouts over the top and serve at room temperature.